Download the black and white PDF. St. Patrick's Day often gets beat up and put in drag for the most part. An online search for Saint Patrick's Day yields recipes for cabbage, tips on which bar offers green beer, and oodles of coloring pages of leprechauns and their pots of gold. Sure, you can study those things as part of Irish lore, but I'd rather not study those things on the day that we celebrate Patrick's life. Especially considering his life was about teaching truth. Geography: Locate Scotland on the map. (Patrick was born in Scotland, probably Kilpatrick). Locate Rome (to point out that the Romans' reach stretched all the way to Britain. They were in charge of that area at the time.) Locate Ireland. (He was kidnapped by a raiding party at fourteen and taken to work as a slave in Ireland. Later, he escaped, but then returned back to Ireland due to a dream he had. He, as a bishop, preached and converted most of the people to Catholicism. 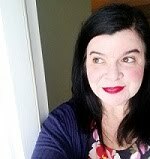 )Writing: Write your own version of an Irish blessing. Practice penmanship with the following traditional Irish blessing: "May the road rise to meet you, May the wind be always at your back. May the sun shine upon your ace, the rains fall soft upon you fields, and until we meet again, may God hold you in the palm of His hand. "Write a brief report about Saint Patrick. Pretend to be Saint Patrick. Write a journal entry about your time either as a slave, on the ship or as a bishop. Older kids can read this long bio. (It's a bit dry, but informative. DVD: Watch "Patrick, Brave Shepherd of the Emerald Isle." Read about Irish saints, draw a picture of them (or download one from the Internet. Use Google image search ... carefully) and write a sentence about each one for your own Irish saints booklet. Informative links: Irish Culture and Customs Women for Faith and FamilyEnchanted Learning has some maps of Ireland and craft ideas, but the site is heavy on the leprechauns and Irish lore. 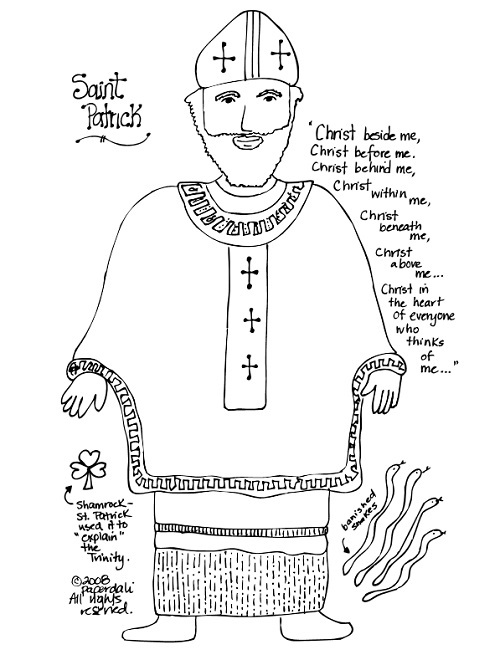 Hi thanks for this - some great ideas - I'd love to print your drawing of St Patrick to use at a school assembly. Is that ok?